Leicestershire are keen on signing West Indies superstar Chris Gayle as their second overseas player for their Twenty20 campaign, but admit they may not be able to afford him. 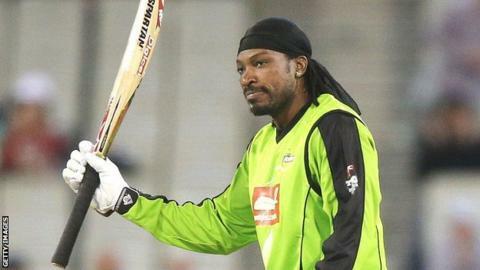 Chief executive Mike Siddall told BBC Radio Leicester: "Chris Gayle would be a money-spinner if we can afford it. "We'll have to see. Probably not, but you never know. We don't know yet." Meanwhile, the club are closing to signing a replacement for main overseas player Ramnaresh Sarwan. And with the Champions Trophy in June and another triangular series after that, as well as the new Caribbean T20 Premier League, Sarwan's availability for the domestic season in England could be limited. Head coach Phil Whitticase said: "It was initially a bit of a shock for Ronnie to be re-selected but I am really pleased for him to be back in the set-up. "We have been having chats about his availability to us and the concern that he may or may not be available in the summer. "But we are confident that we will have Ronnie for the start of the season and certainly for the first five Championship matches. "That will leave us a bit short at the end of the season and has opened up an opportunity. "I have been talking to agents and players and I am pretty optimistic we will get somebody in place to boost the batting line-up." Leicestershire are also on the verge of completing a deal to sign 28-year-old former Middlesex and Gloucestershire bowler Anthony Ireland. "He has a good record and a good one-day international record with Zimbabwe," added Whitticase. "He has vast experience and we are looking to talk to him about a deal for the season."